Our Marilla dress is cut from a lovely Hemp & Organic cotton textile. 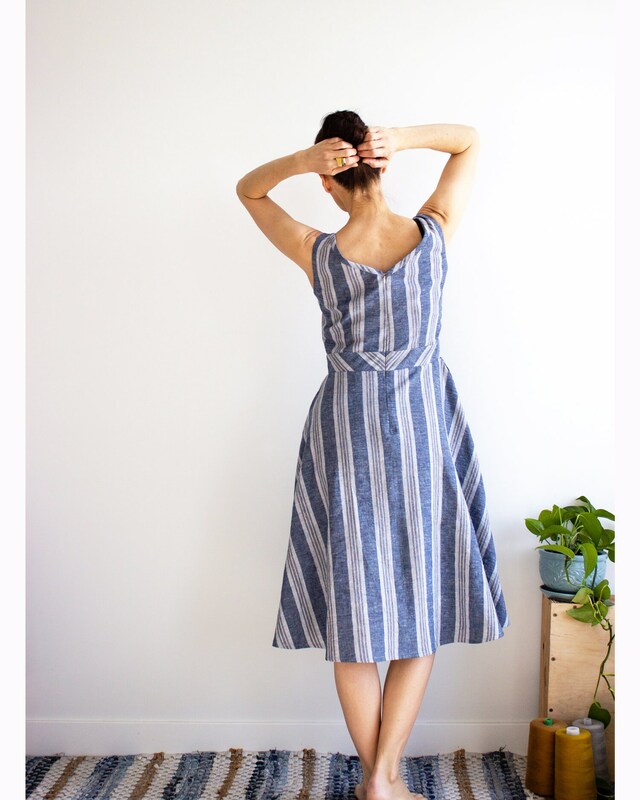 Perfect for spring and summer days - it will surely be the dress you grab for gatherings, events or market days. This flirty number comes with pockets too - so there's that! Our eco friendly textile, paired with sustainable small batch manufacturing means this dress is a true winner for our eco-conscious clients. Ethically handmade (with love) in our Canadian designer studio! > Please refer to the sizing chart included in the photos to select your size or contact us with your measurements if unsure of sizing or require customized sizing. We are here to help! > Dress is cut to be fitted in the bust & waist. Fitted at natural waist and comfortably skims at hip. > Our model Chantale (in our White stripe linen / full lining option) is wearing a custom fit. She measures 42.5"/37"/49" (Size D cup). 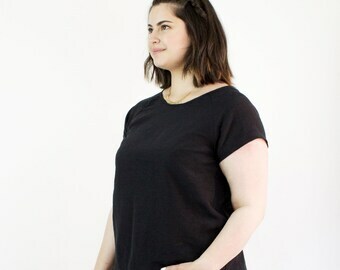 She is a very close fit to our XXL/16 with an adjustment in the waist and cup size & hip. Can I give this 10 stars? This is a gorgeous dress. GORGEOUS! The length is perfect. The pleat details in the skirt are perfect. The pockets are perfect. The fit and flare is perfect. This dress is worth every penny. Fits true to size. Basically, just buy this dress. Thank you. 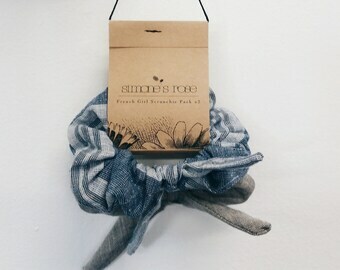 Thanks for these pretty little scrunchies Michelle! They came in the mail yesterday and I haven't had them out of my hair since! I absolutely LOVE them. These are cute and as described, but the elastic inside does not stretch very far. great quality! beautifully packaged and delivered! We love custom orders! Please contact me should you want an item customized or personalized. Please note custom orders do require extra time and effort therefore cost may be adjusted to accommodate your request. Please also allow extra time for your order to be processed when requesting customization. Sizing charts and detailed fit information are included in the description of all listings. 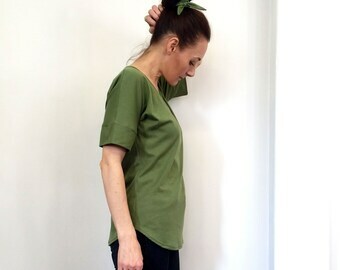 Scroll through photos to find our sizing chart or visit simonesrose.com and find our sizing and care information in the footer section of our website. Most listings include very detailed descriptions of the fit of each item. Please contact me should you require more information. Detailed care instructions are typically included in the description of each listing. Most fabrics are pre-washed and pre-shrunk prior to construction. Hooray! Please contact me should you require more information about a specific item. Packaging: We use recycled or recyclable materials for packaging as much as possible. We also avoid using plastic materials when possible. If required, we will upcycle plastic from packaging we receive or source from recycling to protect your orders. Please note we strive to be Zero waste and truly appreciate that you recycle or re-use packaging that you receive from us. Yes, we do wholesale! Please contact me should you be interested in carrying Simone's Rose in your boutique. Our packages are shipped Standard Air Mail unless otherwise requested. Please note this does NOT include tracking unless you are located in Canada. Please contact us with your mailing address and contact number prior to processing your purchase should you require tracking, Expedited or Priority shipping. We will provide you with your options accordingly.